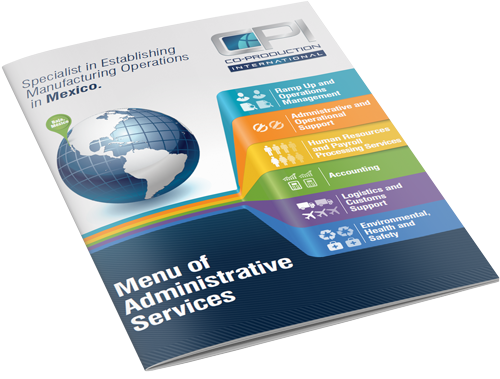 Administrative Services - Co-Production International, Inc.
Here’s a look at the major administrative and operational support services we offer in Mexico. For a complete list, please download our full Menu of Services. While You Focus on Manufacturing – We Handle the Rest! Setting up manufacturing operations in Mexico requires a solid administrative and back office infrastructure. That’s where CPI comes in. Our administrative support staff is experienced and ready to handle the set-up and ongoing administrative functions required to successfully operate in Mexico. From International trade and compliance (import/export), hiring, recruiting, payroll and personnel outsourcing, to ensuring compliance with environmental health and safety (EHS), Mexican taxes and laws. We do it all. If your company is operating under our maquiladora shelter program in Mexico, this means the liability for compliance falls on us. With CPI you don’t have to reinvent the wheel, costing precious time and money. We provide an all-encompassing administrative hourly rate that is more cost effective than contracting individual service providers. Leverage your capital with the cost-advantages of our comprehensive and “all bases covered”. We develop a cost analysis comparing costs in the US versus Mexico for everything from labor to real estate. This cost analysis will demonstrate how your expansion into Mexico impacts your bottom line and gives you a competitive advantage. Want to see what your operational costs will look like? Click here to run your numbers today! We establish a legal corporation in Mexico for you that adheres to federal, state, and municipal laws. We process all necessary permits, comply with environmental regulations and facilitate agency inspections. CPI has long-standing relationships with many industrial parks and realtors. After assessing your needs, we find several options from which you can choose. We facilitate landlord negotiations, leasehold improvements, connection of utilities, and other needed services. CPI has technical and IT personnel on staff to resolve issues with phone systems, internet and computer needs. CPI's executive management team are second-generation experts in facilitating your company's growth and expansion into Mexico. Our community ties, robust network of contacts, and our “know-who” to get it done virtually guarantees your success in Mexico. CPI facilitates all recruitment processes (job descriptions, employee wages, pre-screening, qualification and testing). We handle employee contracts, Mexico labor law compliance, medical benefits, documentation, and administration of your Mexican workforce. We coordinate employee interviews and hiring based on your requirements and approval. We hire the best with the goal of creating a dedicated workforce with low turnover. CPI manages every aspect of the payroll processing, including payments via direct deposit, payroll taxes, medical and annual accruals (vacations, severance, profit sharing & holidays, etc.). CPI manages your service contracts, vendor payments, AP & AR, required legal documentation and compliance reporting for all aspects of your operation. We are accountable for Mexican taxes including payments, reconciliations, federal/state declarations, value added tax declarations (IVA), as well as transfer pricing tax. CPI manages cross-border logistics and transportation of your materials and products, ensuring minimal border crossing waits and just-in-time delivery. We are experts in international trade and treaties and can ensure you receive their due benefits. CPI makes sure that your manufacturing operation works in compliance with Mexico's environmental regulations. Our EPA Department works closely with the appropriate Federal, State and Local authorities ensuring compliance and minimal interruption of production. You can choose from all or some of menu of administrative services. Every prong of our services are designed to ensure your facility is operating at peak performance with minimal costs and in full compliance with Mexican laws and regulations. CPI offers project management and consulting services for companies seeking to establish manufacturing operations in Mexico. We can curate our services to fit your exact needs at any given time. "After a thorough search of shelter companies, ICON selected CPI because of their local expertise and cultural fit with ICON. CPI demonstrated they understood the keys to ICON's success in Mexico and that they could execute quickly given ICON accelerated timeline." "Aspen Medical Products was very diligent in choosing a shelter services company. We did extensive research and felt that CPI was the best shelter services company for Aspen in Tijuana and by partnering with them, we were able to minimize our risk of operating in a new country." Vice President of Strategic Initiatives, Aspen Medical Products. Contact us with any questions or inquiries or call (855) 480 0837. We would be happy to answer your questions and set up a meeting with you. We are here to support from the early stages of your exploration process to the complete set up your operation in Mexico. © Copyright 2019 Co-Production International, Inc. All Rights Reserved.